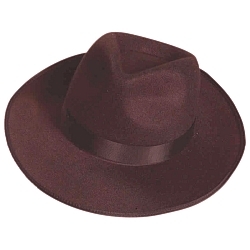 This fedora is made of profelt, it has a flocked wool like finish. This fedora is perfect for a number of different characters including Gangster, Raiders like Indian Jones, Freddy Kruger when paired up with one of his gloves, or the 4th Doctor from the BBC series Doctor Who when paired up with his signature scarf. Hat is available in brown and is one size fits most.